This is by far a revenue- money maker cruise for NCL and not about the best possible “Guest” experience. With over 4000 cruises NCL “missed the boat” when it comes to “ public” venues...with over 4000 Guests and plenty of cabins they did NOT have public spaces large enough to accommodate a group of this size and everything needed a reservation but was sold out within hours of boarding and up charges for everything?!! NCL has lost their ability to offer “freestyle” cruising but has enhanced their ability to pack people on a ship causing overcrowding but for sure this ship has become a money maker for them! Their Management team had the worst attitude and rude and did not aim to please from Cruise Director to Hotel Director to Group Leaders to Staff...so many rigid rules that benefited NCL but NOT the Guests! Safety issues for sure! On a positive note- food was great but service was slow and Jersey Boys Show was excellent while Havana Show put me to sleep! I loved the single Studio cabin! I have cruised with NCL over 12 times and have been pleased with other ships but I do NOT recommend the Bliss. The PORT of departure experience was the worst ever...no bays for buses and nothing but traffic jams trying to board/disembark from the city streets of Seattle-hard to believe NCL did not have a better plan for a ship with so many passengers?! Best part of this cruise was viewing the beauty of Alaska but that can be done on any ship with any cruiseline NCL needs to step up to compete with other cruiselines for the best “Alaskan” experience! This is by far a revenue- money maker cruise for NCL and not about the best possible “Guest” experience. With over 4000 cruises NCL “missed the boat” when it comes to “ public” venues...with over 4000 Guests and plenty of cabins they did NOT have public spaces large enough to accommodate a group of this size and everything needed a reservation but was sold out within hours of boarding and up charges for everything?!! NCL has lost their ability to offer “freestyle” cruising but has enhanced their ability to pack people on a ship causing overcrowding but for sure this ship has become a money maker for them! Their Management team had the worst attitude and rude and did not aim to please from Cruise Director to Hotel Director to Group Leaders to Staff...so many rigid rules that benefited NCL but NOT the Guests! Safety issues for sure! On a positive note- food was great but service was slow and Jersey Boys Show was excellent while Havana Show put me to sleep! I loved the single Studio cabin! I have cruised with NCL over 12 times and have been pleased with other ships but I do NOT recommend the Bliss. The PORT of departure experience was the worst ever...no bays for buses and nothing but traffic jams trying to board/disembark from the city streets of Seattle-hard to believe NCL did not have a better plan for a ship with so many passengers?! 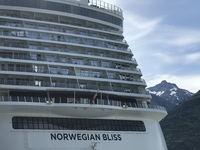 Best part of this cruise was viewing the beauty of Alaska but that can be done on any ship with any cruiseline NCL needs to step up to compete with other cruiselines for the best “Alaskan” experience! Nice cabin-great for singles and best thing about this ship!